The surface horizontal or vertical multi-phase or multicellular centrifugal pumps use the centrifugal effect of their rotors to move the liquid and transform mechanical energy coming from the motor in kinetic energy n then, successively in pressure energy to transfer it to the pumped liquid. Every rotor is dynamically balanced and the seal can be either soft shaft or mechanical. The layout of the suction vents is horizontal, turning upwards, but upon request they can be set at 90°. The coupling with the electric or diesel motor is direct through and elastic joint on the same frame. The great variety of versions and performance make this series of pumps extremely versatile for any use. 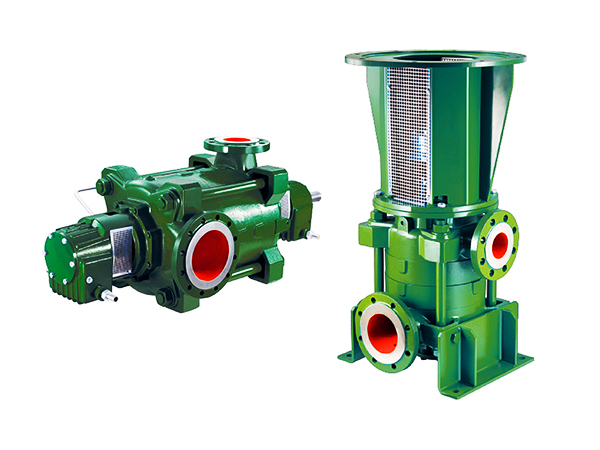 Among the main fields of application, multicellular pumps are used for fire systems, irrigation, snowmaking and for the industrial sector, for mine drainage, for washing, for pumping stations and pressurisation installations.